The life of the English humanist (one who studies human nature, interests, and values) and statesman (political leader) Sir Thomas More represents the political and spiritual disorder of the Reformation (the time of religious change in the sixteenth century that moved away from Roman Catholic tradition toward Protestantism). The author of Utopia, he was beheaded for being against the religious policy of Henry VIII (1491–1547). 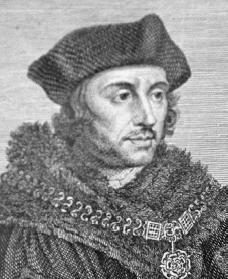 Thomas More was born in London on February 6, 1478, to John and Agnes More, whose families were connected with the city's legal community. His father, John More, was the butler at the lawyer's club, Lincoln's Inn, as his father was before him. John very much wanted to be a lawyer himself. That opportunity came when he married Agnes Granger, the wealthy daughter of a local merchant. In marriage she shared some of that wealth with John. He was well-liked at Lincoln's Inn and was voted to be a member and then was admitted to the bar (a group of practicing lawyers). Agnes and John had four other children besides Thomas but three died very young. Thomas' education began at a prominent London school, St. Anthony's. In 1490 Thomas entered the household of Archbishop John Morton, Henry VII's closest adviser. His mother and father's connections made this possible. Service to Morton brought experience of the world. In 1492 More transferred to Oxford, where he first started Greek studies. Two years later he returned to London, where legal and political careers blossomed. By 1498 More had gained membership in Lincoln's Inn. More, while pursuing his legal career and entering Parliament in 1504, was drawn to the Christian humanist circle. This philosophy (the study of knowledge) coupled the study of Greek with the study of the gospel in seeking a more direct message. He spent his mid-twenties in close touch with London's strict Carthusian monks and almost became one. But More then decided that he could fulfill a Christian call to ministry while remaining a layman (non-clergy). More first married Jane Colt, who bore three sons and a daughter before dying in 1511. He then married Alice Middleton. His legal career grew and led to an appointment as London's undersheriff in 1511. This meant additional work and income as public lawyer at Henry VIII's court and as court representative with foreign merchants. More's first official trip abroad, at an embassy at Antwerp in 1515, gave him leisure time in which he began his greatest work, Utopia. Modeled after Plato's (c. 427–c. 347 B.C.E. ) Republic and finished and published in 1516, it describes an imaginary land, free of the prideful greed and violence of the English scenes that More had witnessed. In Utopia More discusses the difficulties of counseling (as a lawyer) princes. This awareness kept him from accepting frequent invitations to serve Henry VIII, whose policies were often quite opposite to the humanist's philosophy. He finally accepted Henry's fee late in 1517 and had a solid career in diplomacy (the conduct in dealing with other nations), legal service, and finance. In 1529 he was chosen as the successor to Cardinal Wolsey as chancellor (secretary of the king) of England. More's early doubts, however, proved justified. Under Wolsey's direction More, as Speaker of the House of Commons in 1523, promoted a war tax so unpopular that its collection was discontinued. Wolsey's inability to obtain the annulment (to make invalid) of Henry's marriage to Catherine of Aragon (1485–1536) had raised More to highest office, and had placed him in the increasingly distressing role of Henry's chief agent in the strategies that began to sever England from Rome. More was deeply engaged in writings against Lutherans, defending the fundamental (essential) rules of the Roman Catholic Church, whose serious defects he knew. More cannot justly be held responsible for the increased number of Protestants killed during his last months in office, but this was the gloomiest phase of his career. He continued writing until a year after his resignation from office, given on May 16, 1532, which was caused by illness and distress over England's separation from the Catholic Church. accompanying oath that denied the pope's power in England. More's last dramatic year—from the first summons for questioning on April 12, 1534, through imprisonment, trial for treason (the act of betraying one's country), defiance of his lying accusers, and finally execution (a death sentence carried out legally) on July 6, 1535—should not be allowed to overshadow his entire life's experience. Its significance extends beyond the realm of English history. For many of Europe's most critical years, More worked to revitalize the Christian world. He attacked those who most clearly threatened its unity; once convinced that Henry VIII was among their number, More withdrew his service and resisted to his death the effort to remove his loyalty. Ackroyd, Peter. The Life of Thomas More. New York: Nan A. Talese, 1998. Gallagher, Ligeia. More's Utopia and It's Critics. Chicago: Scott, Foresman, 1964. Marius, Richard. Thomas More: A Biography. New York: Knopf, 1984. Monti, James. The King's Good Servant But God's First: The Life and Writings of Saint Thomas More. San Francisco: Ignatius Press, 1997.